There’s something different in the air tonight: I’m featuring two friends instead of one! Everyone, meet Kelsey and Liz. They’re some of the nicest people you’ll ever meet, and The Roommate and I are currently in talks to move in with them at the end of the summer (because I don’t know about you, but DC area rent is far less stressful when it’s split four ways instead of two). Kelsey and Liz do something that I had honestly never heard of when I met them. I’d heard of karaoke, of course, and I’ve participated in it a few times at bars that fall everywhere on a scale of “dive” to “whoa, are we even allowed in here?”, but man, they take karaoke to the next level. I present to you: District Karaoke. That’s right, there are teams that compete all around the DC area in various match-ups, with both solo and group numbers. Points are awarded for creativity, and these girls get these points in spades. 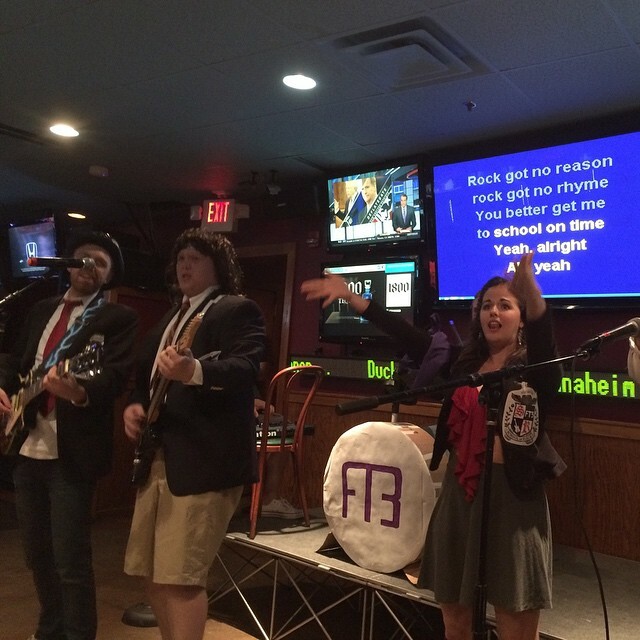 Here’s Kelsey and a few of her group members performing the final number from School of Rock on the 2000s themed night. The Boyfriend is in this picture too, but it wouldn’t be fair to do a post about him. Just accept that he’s pretty cool. As you can see, costumes and props are encouraged. One time, Kelsey sang “Say Something I’m Giving Up on You” (I don’t know the actual name of the song, but I think it’s by Christina Aguilera?) as Tom Hanks’s character in Cast Away at the moment he lost Wilson to the sea (I’ll give you a moment to sob). 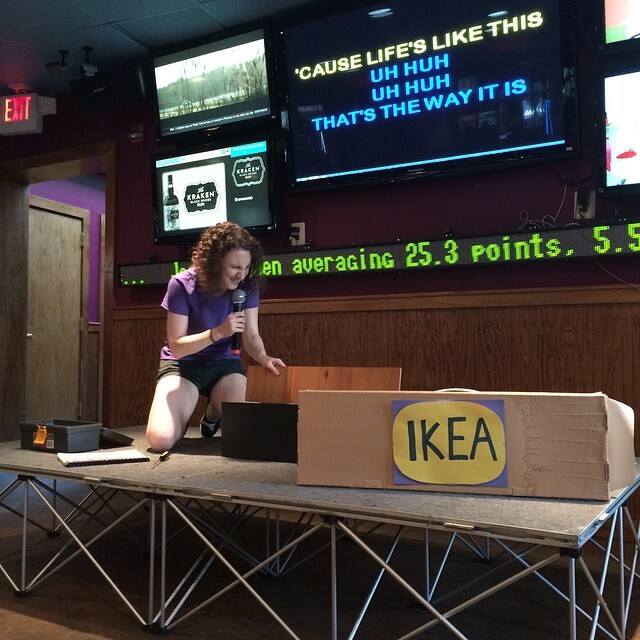 And here’ Liz in a solo competition, singing Avril Lavigne’s “Complicated” to a box of Ikea furniture. So basically, Kelsey and Liz have discovered the absolute COOLEST way to get out and have some fun at a bar on a Tuesday night. Seriously, I’m not even a huge fan of the bar scene and I can’t wait to hear what they’re coming up with next. I’m hoping it has to do with Harry Potter, because that’s actually something that I talk about with them on a semi-regular basis.